During a four day trip to Amsterdam, my husband and I decided to take a very quick train ride over to Zaanse Schans so we could see some of Old Holland. Traveling by train was very easy and is my preferred way to hop around Europe. Clogs, Windmills and Cheese - count us in!! If you are in Amsterdam and want to visit Zaanse Schans, I strongly suggest doing this on your own vs. a guided tour. You can come and leave as you please plus it was only a few Euros for our train vs $60 a person for a tour via bus. When we got off the train, the first thing we smelled was cocoa. It was the most amazing smell you can ever imagine. This made sense as the Cacaolab right down the street from the train stop. If you could only bottle that smell up - and I am not even a huge fan of chocolate! While Zaanse Schans looks like a scene out of Epcot, it is actually a residential town with working windmills. The mills, workshops and barns can be found all over town. I became obsessed with taking photos of the Zaanse Schans windmills. They were fascinating & I forgot to take this video on landscape mode - rookie mistake. After we took about 100 photos of the windmills, we headed over to the Cheese shop. If you know my love of cheese, you know I was in heaven. I tried close to 20 different varieties of cheese. Everything from truffle to chili. Back to the Windmills! This windmill is called De Gekroonde Poelenburg and it was making sawdust while we were there. OK done w/ Windmill photos, I promise. We found ourselves at the Clog Factory next. I went from being obsessed with taking photos of Windmills to becoming obsessed with clogs. I guess this is because I don't see these two items on a frequent basis. Plus, I dressed appropriately for these photos and giggle each time I look at them. 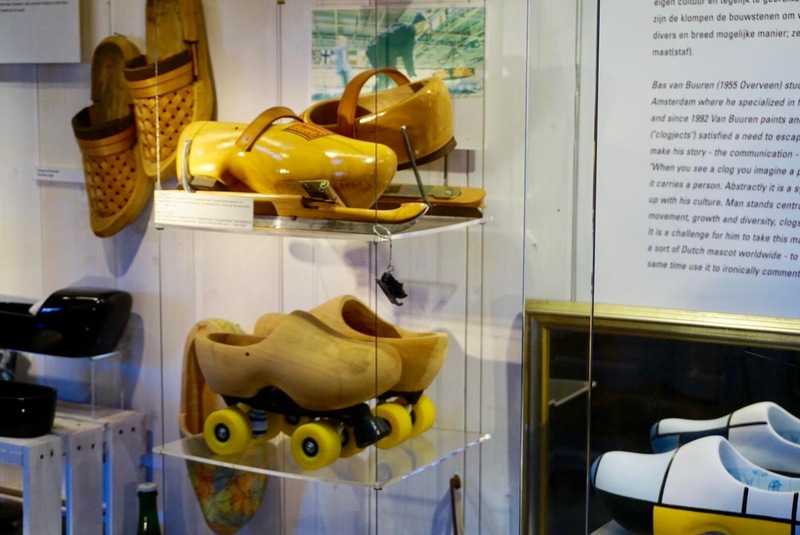 The clog workshop had so many different varieties of clogs including Clog roller skates and clogs on a bike. It was really neat to watch people making clogs by hand and I almost bought a pair - but my husband quickly brought me to reality. Overall, we spent 2 hours at Zaanse Schans. It was a quick trip over and we really enjoyed ourselves. The city was truly something out of a story book. While traveling, I strongly encourage you to do a little research on neighboring towns. We had a fantastic quick visit and was back in Amsterdam just in time for lunch.